The original concept art for EPCOT was more Blade Runner than Drinking Around The World. EPCOT stands for Experimental Community Of Tomorrow. Walt Disney coined the acronym in the 1960’s to refer to a concept that was quite different from the theme park that it became. 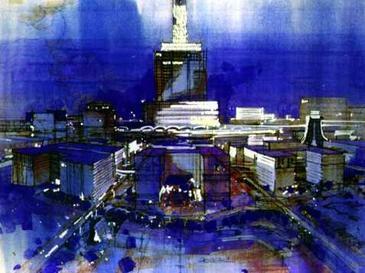 Disney wanted to create a company town, a place for his employees to live and work, he intended this town to be a meticulously planned corporate-ruled futurist city-state – with housing, laboratories, an industrial park, a commercial district with a towering central hotel— it was meant to be a place to showcase the newest cutting-edge technology as well as to demonstrate Disney's ideas about organizing and governing a city. This was the original plan for the 27,800 acres of swampland that Disney bought through a set of shell corporations in the 1960’s. Disney also successfully lobbied the state to create the “Reedy Creek Improvement District” a micro-state within the state that gave Walt Disney Productions full jurisdiction over that land. After Walt’s Death from lung cancer in 1966 (the freezing thing is an urban myth—and it isn’t exactly true that his last words were “Kurt Russell”- the real story is that the last thing he did before dying was write “Kurt Russell” on a memo about future TV projects)- the idea for a futuristic Disney city was shelved, and the land was re-purposed as Disney World and its surrounding resorts—what we now just call ‘Disney.’ The concept was revived in the early 80’s as the EPCOT Center theme park, though it’s a far cry from the original idea, the opportunity to ‘Live in Disney’ appeared in the 90's in the form of Celebration (which is brilliantly satirized in T.C. Boyle’s story ‘Jubilation’), and almost everything in the Reedy Creek Improvement District itself is still effectively ruled by senior Disney employees, with almost no oversight from elected officials, or voters, or anything so messy as Representative Democracy. Walt Disney’s dream of building the future in Florida is not as unusual as it sounds. He wasn’t the only one to try this sort of thing, he was only, in a kind of sideways way, the most successful. Billed as ‘The House Of the Future,’ Xanadu was the creation of inventor Bob Masters, who created a process of using polyurethane foam and huge balloons to quickly and cheaply build dome-shaped structures. He built multiple ‘Xanadu’ houses around the country to showcase this technique in hopes that his fast, cheap, and energy efficient building technique would catch on and revolutionize the way homes are built. Shortly after the EPCOT Center theme park opened in 1983, a Xanadu House was opened only a few miles away in Kissimmee. Designed by Roy Mason, the house was strange ultramodern blob that was equipped with a wonderfully early 80’s version of the luxuries and amenities of the future. Xanadu was full of sparkling angular robot servants who spoke in soothing recorded voices, and automated systems that were controlled by commodore computer. The Xanadu houses experienced brief success as roadside tourist attractions, but by the 1990’s their vision of the future began to seem outdated. The Kissimmee Xanadu closed in 1996, and sat abandoned (though frequented by vandals, squatters, and explorers) until it was finally demolished in 2005. Fortunately we have this video to preserve this wonderfully weird past vision of the future. The Nautilus Foundation was the brainchild of Francois Bucher. He was the kind of glamorous academic that existed for a brief time in the middle of the 20th Century. He was a Guggenheim Fellow, a Getty Scholar, a medievalist, art historian, translator, architect, and artist. He taught at Yale, Brown, and Princeton, and was known for his incessant chain-smoking, and his close friendships with the likes of Albert Einstein and Buckminster Fuller. Later in his career, in the late 1970’s, Bucher began teaching at Florida State University. He bought a piece of land in the woods of North Florida to build his idea of an intellectual paradise. Bucher described the Nautilus Foundation as “A place to promote creative thinking of ways to build a better world.” The Foundation’s compound was centered around a central “Modern Art Castle,” and Bucher planned to build art studios, laboratories, dorms, greenhouses, meeting spaces and lecture halls, all with one modest mission: to save the world. Nautilus was supposed to bring together the world’s greatest minds of the arts and sciences in a place where they could collaborate on solving the problems of war, poverty, and environmental destruction. Unfortunately, this dream never really came to fruition, but Bucher built many unusual structures and sculptures on the land and lived there until his death in 1999. The ruins of the Nautilus Foundation are still there, but they are unfortunately privately owned, and fenced in behind many, many no-trespassing signs. 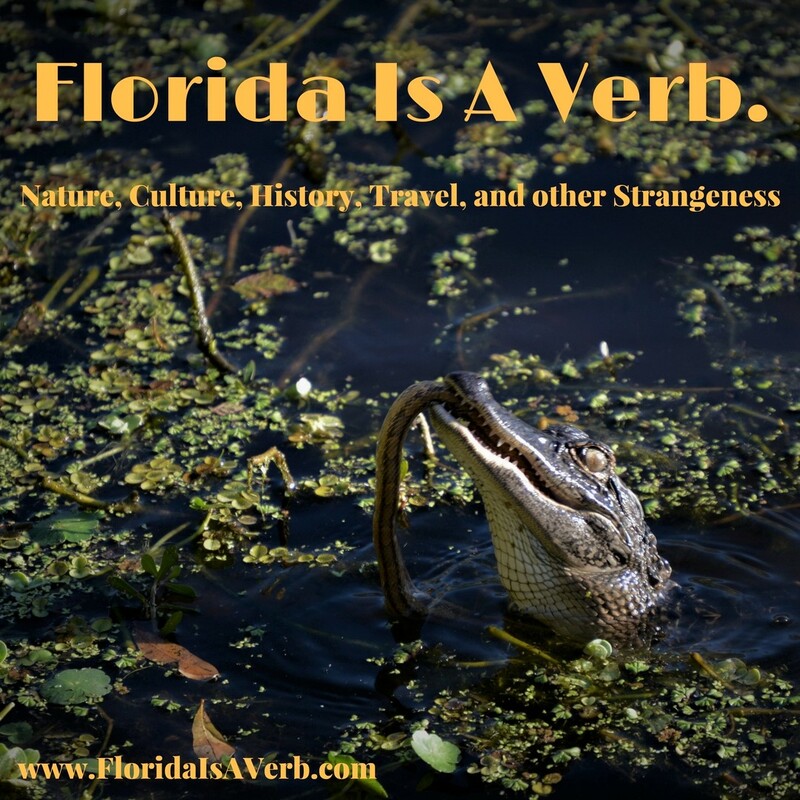 The only experiment in Florida futurism that is still operating (that I know of) is The Venus Project, the creation of inventor and industrial designer Jacques Fresco, and artist Roxanne Meadows. They created the futuristic ‘research center’ in the tiny community of Venus Florida in the early 1980’s. The idea was to demonstrate what Fresco called a Resource-Based Economy- a world without money where resources are allocated according to need, and to research the technology to make such an economy possible. (Of course, the current price tag on a tour of the Venus Project is $200, and Fresco attempted to Trademark the phrase ‘Resource-Based-Economy’ in 2010, but who’s keeping score? I mean, we’re not in the money-free future yet, after all.) After Fresco’s death (at the age of 101) in 2017, Meadows took over the leadership of The Venus Project, and she continues to give tours of the research center and write and lecture on the Project’s vision of the future.Of course anything as revolutionary as abolishing currency is going to be controversial and the Venus Project has been called everything from a hoax, to a cult, to a slippery slope to the gulag-- when, in fact, it's probably just an unusual way to blow $200 during a Florida vacation, a quirky alternative to the usual Theme Park Ticket -- maybe it's just the current time's equivalent to The Nautilus Foundation or a Xanadu House, a lofty and hopeful vision destined to become a curiosity.